Our tester finds that this spot turns transforms an errand into an experience. Editor’s Note: Compiling each Best of Atlanta issue is a months-long process that involves every member of our staff and a team of trusted freelancers. Before we give a business, service, or destination our stamp of approval, we conduct a test (or two, or three). We pay full price, go anonymously, and do the best to have the same experience you, the reader, would. In these field notes, our testers share their experiences working on Best of Atlanta 2014. It’s 9:30 a.m. on a Thursday, and I’m sitting at a bar inside of a car wash, realizing my knowledge of breakfast cocktails is shockingly limited. Normally at this hour I’m dumping packets of Splenda into less-than-stellar breakroom coffee, so I order the only thing I can think of—a Screwdriver—which is promptly served to me in a glass with a huge wedge of orange perched over the rim. Next to me, my boyfriend’s attempts to start the day with a Bloody Mary have been thwarted by a lack of mix, so he sips a Salty Dog, made like mine with a $5 shot of Grey Goose, the day’s special. The appeal of Midtown’s Auto Spa Bistro is evident right off the bat. With a little restaurant and bar housed in what is usually a waiting room littered with outdated magazines, a mundane chore suddenly becomes a leisure activity. And in the Bistro, the only reminder that you’re even at a car wash comes from the framed photos customers’ hot rods hung on the walls. Purple and white snakeskin chairs, a wall of plush violet velvet, and a granite bar stocked with bottles of liquor give off more of an ultralounge vibe, as does the 90s R&B played over the speakers. On a Thursday morning, this space is made for lounging. Only about two other people came in during our hour or so at the bar, so we were content to just sit back and listen to the music while watching the TVs hung over the bar (VH1 still plays music videos—who knew? ), or glance over at the giant windows to watch the suds roll off my boyfriend’s car. 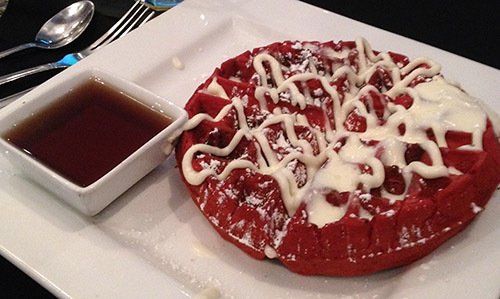 From a fairly extensive brunch menu, we ordered red velvet waffles and deep-fried French toast, both of which weren’t too bad for a place that waxes your car. So how does the actual car wash hold up? Pretty well, actually. Upon inspecting his car, my boyfriend said it looked solid for a hand-wash job. But Auto Spa is thorough almost to a fault—upon climbing in the car, we sat down into wet seats, unpleasant after a relaxing morning at the bar. We ended up dropping about $60 total for the wash ($30), two drinks ($10), and food ($20), which is a bit extravagant. But as an experience, it was fun. It’s a good place to hide away if you just need a break from life’s stressors. You can be productive while feeling like you’re anything but.